My best friend Jill and me in Chicago, summer 2007 - we were still in college, and we took a road trip out here with our friend Christina. It was amazing. I can't wait to see them all again and take crazy jumping pictures! They always make me smile. (2) My long run yesterday was a bust - I was supposed to do 4.25 miles, but needed to stop after 2.75. I'm not feeling too bummed, because I know exactly why it happened: I started too fast, and I wasn't properly hydrated. I started cramping up and so I just did what I could. (5) I completed goal #57, donate to a cause I believe in. I decided to make a donation to the Greater Chicago Food Depository to celebrate my one hundred pound weight loss, and this week I finished getting the funds together to send off. I felt really, really good about doing this - $100 feeds 120 people for a day. That's so unbelievable to me. 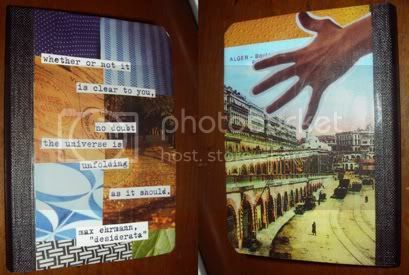 The front has a quote from Max Ehrmann's poem "Desiderata": "Whether or not it is clear to you, no doubt the universe is unfolding as it should." An amazing quote, and I thought it was totally perfect for the situation. (9) I wore my hair down a few times - it's naturally very curly, which I love. And I've been noticing lately how much healthier it is now that I eat better ... not sure if there's an official scientific correlation, but I'm sticking with it. New month! How are you feeling with the end of the challenge coming up soon? A little nervous! I haven't done anything for two of my goals yet: #6 (visit 3 museums on Free Days) and #10 (go to the opera). So this should be a fun and busy month! What would you change differently about this challenge for the Spring Fever Challenge beginning soon? I honestly can't think of anything - I think Amy has done a great job hosting this and sending out questions every week. I'm totally into challenges - they help me to focus on short-term goals that aren't related to the number on the scale. What have you learned about yourself during this challenge (or past few months)? This is a pretty loaded question, haha. I'd say that in terms of challenge-related lessons, I've figured out that it's kind of hard to do one thing specifically every week to make me feel gorgeous. I have to really think about it sometimes. I'm getting better - and wearing a little makeup has become a regular thing now! - but it's still something I have to consciously work into my week. Do you enter contests? Have you ever won one? I won a raffle for a poster in college, but I don't think I've ever won anything big, interesting, cool, or amazing. My sister Katie is the lucky one in our family - she once won $500 in a contest from a newspaper, and she used the money to buy our mom a Kitchenaid stand mixer for Christmas that year. She's such a nice kid ... maybe the good karma is why she's so lucky! I actually made this one of my 101-in-1001 goals: #66, win a raffle/giveaway. It has little to do with getting luckier, but I wanted to take more risks. Raffles and giveaways are, of course, low-risk risks, but still, I want to try. You can't win if you don't try! OH~and I'm on the little make-up a little more often, too. Feels good! Wow, I love that picture. So full of joy. I don't even know the people in the picture and it makes me smile. Love the picture!!! So fun!! 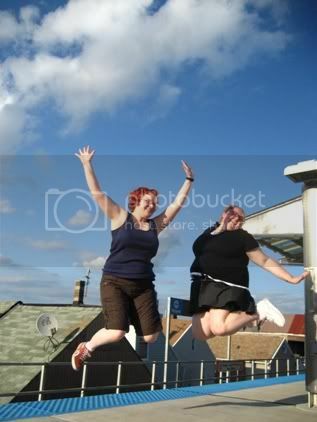 That jumping picture is AWESOME!! I absolutely love that photo. Pure happiness! What a great picture! I love your blog - you are an inspriation! I'm so looking forward to the Spring challenge - I think what I'm going to do is less goals... and since I love your do something that makes you feel beautiful weekly goal... I might just make it a mandatory goal! (I know Half of Jess first came up with it! ).